By: Sparber, W., Napolitano, A. and Melograno, P.
The use of renewable energy in buildings is a very important challenge in order to decrease their primary energy consumption. In South of Europe, most of buildings, especially tertiary ones, need active cooling in summer and this often represents an important way to save fossil energy. 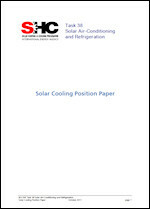 Solar cooling technologies already exists and have shown their effectiveness at the demonstration stage. But some particular precautions must be taken at different levels to have the best conditions. This method is aimed at presenting a methodology based on a check list. The decomposition of the problem in different and following steps permits to see whether the project is realisable or not at the design phase. If this is the case, the method shows afterwards the requirements on some parameters of the projects : materials, planner, building owner, installer, exploitation staff and monitoring of the installation. Thanks to this check list method, an integration of a solar cooling system can be done in suitable conditions. For instance, the method can make appear decisive parameters which would be very unfavourable for a successful project. 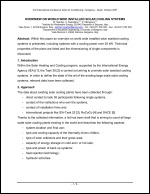 This check list is based on the feed back of European solar cooling experiences in the framework of the IEA Task 38.